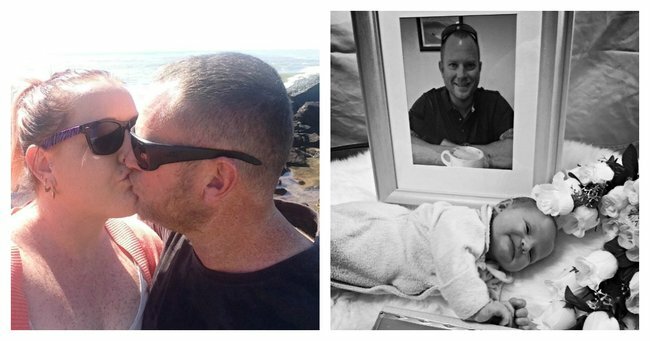 "I never thought I'd birth a newborn the same day my husband killed himself." It was a Monday morning in May when Nicole Astill last saw her partner, Patrick Foresi. He had a long history with depression and anxiety, and “woke up in a mood.” The last thing he said to Nicole, who was eight months pregnant, was that they would be better off without him. It was one month later, on the same day Nicole gave birth to baby Henry, that she learnt her husband had taken his own life. Here, she writes for Mamamia about her harrowing experience. Trigger warning: this post contains material which may be distressing for some readers. At 29 years old, I never in my life would have thought that I would be a mum to a newborn baby boy the same day that I became a widow. To tell you my story, I need to take you back in time. I met Pat whilst working in Roma in Queensland. I used to tell people that Pat chased me and tried to gain my affection, but in reality it was the other way around. Not long after making it all official, we decided to jump straight into family life and Pat moved in with me and my son. The first few months were everything I had dreamed of. But it wasn’t too long though before I started noticing that Pat was becoming distant, withdrawn and struggled to get out of bed each day. Nicole and Pat. Image supplied. I had never dealt with anyone or knew anyone that suffered from depression before so everything was all new to me. I always did my best to try and lift his spirits, but if I knew then what I know now, I probably would have tried to help him a lot more effectively from the start. Money was a big part of his stress, as was employment. He couldn&apos;t find secure work. Pat felt as though he was becoming too old to be employed. He tried different jobs when there was no work around in his trade, but he struggled to grasp another trade he knew nothing about. His three kids from a previous relationship was his ultimate struggle. He had not seen his kids in over three years due to some complications with his previous relationship. Not having access to his kids affected all of us, but it weighed on him heavily. In November 2015 we found out we were expecting. Pat was over the moon. He was so excited and happy, it took him a couple of months to actually believe it. We were due to have a baby boy on July 7th 2016. Little did I know at the time what July 7th would actually mean. During my pregnancy Pat was very supportive, I was so excited I would talk about the baby every chance I got. Pat was to name the baby and he drove me crazy keeping it a secret, he told me that he would tell me the name he had chosen the day the baby was born. Leading up to the end of my pregnancy I started noticing that Pat had started that all too familiar depressive state again, he became withdrawn, would sleep a lot and started gaining a lot of weight. He would lay on the lounge and grab his head and tell me that his ‘head felt like it was going to explode’. On Monday May 30th 2016 I woke up and Pat wasn’t in bed, I looked at the time and it was 6:15am. Surely I would have woken up when Pat went to work, he kissed me good bye every morning without fail. I got up and noticed on my way down the hall he was still asleep on the floor in my son’s room. I quickly went over to him and gave him a little shake and said ‘Babe quick get up, you are late for work’. He stirred a little bit and once again I shook him and pleaded for him to get up. He hit the roof, he was like a bomb that had just detonated. He started yelling and screaming, he jumped up off the floor throwing his arms up in the air. I immediately jumped back, I tried telling him why I had woken him up and that he was late for work and he wouldn’t even let me speak. The only thing I could do was just let him be, I walked back into our bedroom and laid down. I could hear him rustling around, he was pacing around the house as though he was looking for something. I thought he must of just been getting up to have a smoke. But when I heard the car keys, I got up and walked out to the lounge room just as he was walking out the front door. I asked him where he was going and he couldn’t even turn around and look at me, he just said the words ‘You’re all better off without me’. Nicole and Pat in happier times. Image supplied. Being so far pregnant, I couldn’t exactly chase him. He left in what felt like two seconds. This wasn’t the first time that Pat had taken off on his own. But he would always take his phone with him and I would track his location by using the ‘Find my iPhone’ app. I was immediately concerned when I returned back inside and noticed he had left his phone on the kitchen table. All I could do was just hope that he would come back in a few hours like the other times he would take off. I was due to be at work so I continued to get myself organised like it was a normal day, but I just couldn’t get myself together mentally. My mind was focused on Pat. Once I got to work I started getting pains in the stomach, so after speaking to my colleagues I went straight to the hospital. I was admitted into the hospital and they kept me in there to monitor the baby for the majority of the day. As I was driving home I felt sick to my stomach with worry, I thought surely he would have cooled off and he would be back home by now. As I came around the corner, my heart dropped to see that his car had not returned. For the remainder of the day I paced around the house like a mad woman. I started to become very anxious and constantly kept thinking that he would turn up any minute. But he didn’t. I reported him missing to the police the following day. The police asked me if I knew where he may have gone, my only response was a local national park. It&apos;s quite big, it has quite a few roads, mainly all dirt. "I thought surely he would have cooled off and he would be back home by now." Image supplied. The police drove up to Mebbin that afternoon but were unable to locate him. I drove around all our local areas that we would visit frequently, sometimes I went back three and four times in case I had missed something. My dad had at one stage asked me what I thought he may be doing, I lost all control of my emotions and I said ‘I think he has killed himself. For three weeks I didn’t sleep, I hardly ate, I wasn’t looking after myself. I would lie awake at 2am and look at maps of the park and try and find hidden roads or trails. My brain would ‘hurt’ trying to think of where he could be or what he could be doing, even though my heart was telling me he was already gone. Regardless, I still needed to find him and I also did hold onto some hope that he had just left me and was starting a new life. I needed to let my doctor know what was going on because I felt like I couldn’t continue with the pregnancy anymore in the state that I was in. At this time I was 37 weeks pregnant. My doctor agreed and scheduled me in to be induced the following week. On Thursday, June 23rd I walked into the Maternity Ward and the midwives took me straight into the birthing suite. Immediately everything was too overwhelming, I broke down. The midwives were aware of what was happening and could tell I was extremely tired. They gave me a low dose sleeping tablet and it allowed me to sleep amazingly. Friday, June 24th was baby day. This was the day that our son was going to be born, but without his daddy by my side as we had always planned and talked about. Our son was born at 4:02pm, weighing in at 7 pounds 3 ounces and he was perfect in every way. I was so tired from such a big day so I thought I might get a little shut eye. As soon as she left I turned off the light and rolled over to get comfortable. Two minutes later there was a knock on my door with an unfamiliar voice stating that I had visitors. Visitors??? It was 11pm! I opened my eyes and my mum walked into the room with her eyes all puffy and two steps behind her were two police officers. Nobody had to say a word. I immediately fell onto the bed and screamed and cried until I could not breathe. Mum come over and just grabbed me and held me, but no comfort that was given would have ever taken away the pain. I don’t know how long the police stayed there, I don’t know how long I cried for. The police officially notified me that they had found Pats body at 1.30pm that same day and that he had taken his own life. After the police left I laid on my bed for the next few hours and felt numb. I knew I was sad, but it was as though I couldn’t feel at all. I begged for the Doctor to discharge me home. I didn’t want to be in that hospital anymore, I just wanted to be around my family. Some days I feel like I am okay, other days I am a complete mess and in between I have a variety of different emotions, some angry, sad and sometimes thankful. Visiting the place where Patrick took his own life. Image supplied. I always thought that suicide was selfish, that it was a coward’s way out. But after going through this experience and speaking to others about suicide I realised that it is far from selfish and it is definitely not a coward’s way out. It also made me realise how much he suffered, how much his daily life was taken over by this ‘black dog’. None of Pat&apos;s friends were aware that he suffered from depression for so many years. One of his mates told me how he wish he knew Pat had suffered, as was a sufferer too and he wished they could have talked about it together. Pat had a lot of demons that haunted him, but I think the main thing was that he couldn’t bear living without his kids and feeling like such a failure. After speaking with a close friend who is involved in a men’s group called the ‘Australian Brotherhood of Fathers’ he told me something that disturbed me beyond belief. 21 fathers in Australia take their own life every week as a result of child access issues, child support, financial pressures and unfair court rulings following separation. "Pat had a lot of demons that haunted him, but I think the main thing was that he couldn’t bear living without his kids and feeling like such a failure." Image supplied. While I may never understand why men do not speak about their feelings or seek help, I do know it&apos;s seriously under-reported. I want to get my story out there so men can see the effects of what they are leaving behind, and most importantly that it is ok to speak to a mate, you are never alone. Due to financial difficulty that I was faced with after Pat passing, I was left with a lot of debt. 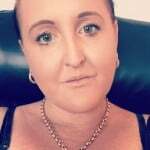 I was unable to pay for any type of funeral and I was not eligible to apply for a destitute funeral as Pat does have family. I received hundreds of messages of support, people I knew and people I had never spoken to in my life. My friend set up a Go Fund Me page to allow me to at least have Pat cremated without service. I will forever be so thankful for all the help I have received. Pat was cremated on our sons due date. We celebrated his life in a unique way in which I think he would have wanted. We went to one of his favourite spots, listened to all of his music, had beers, released some balloons and then I scattered his ashes into the river. People there said their goodbyes, but as I released him into the river I couldn’t say goodbye. I don’t feel as though I am ready to say goodbye. If you or a loved one is suffering with depression, Mamamia urges you to contact Lifeline on 13 11 14 or to visit the Beyond Blue website.